As soon as I saw this recipe on Closet Cooking, I knew I had to give it a try. I've always enjoyed gnocchi when out at restaurants. I never knew how simple it was to make them from scratch! These gnocchi were on my menu for Friday night, but of course, plans changed. When I got home from work, my mom picked me up to go to the hospital and visit my grandpa. We ended up staying longer than we thought (no big deal, we were having a good visit). I walked in the door about 5 minutes before Joel got home from work. No sooner than I popped the potatoes in the microwave, Joel walked in and suggested that we go out instead because he was starving. Too bad the restaurant we chose to go to took FOREVER (seriously, it took about an hour to get our food from the time we ordered)! Oh well, at least that meant that Saturday night's dinner was already planned. *The only change I would make when making these the next time is that I would use a potato ricer so that the potatoes get completely mashed. My gnocchi had chunks of potatoes within them! Prick the potatoes with a fork. Bake in a 400 degree oven for about an hour, until tender. *Alternatively, you can cook them in the microwave on the "baked potato" setting, which took about 5 minutes. Scoop the insides out of the potatoes and mash them. Mix in the egg and enough flour to form a soft dough that is not too sticky to work with. Knead the dough for about 1 minute, then roll it out into 4 long, thin rolls about 1/2 inch thick. Cut the rolls into 1/2 inch pieces, then roll the pieces in flour and lightly shake off any excess. 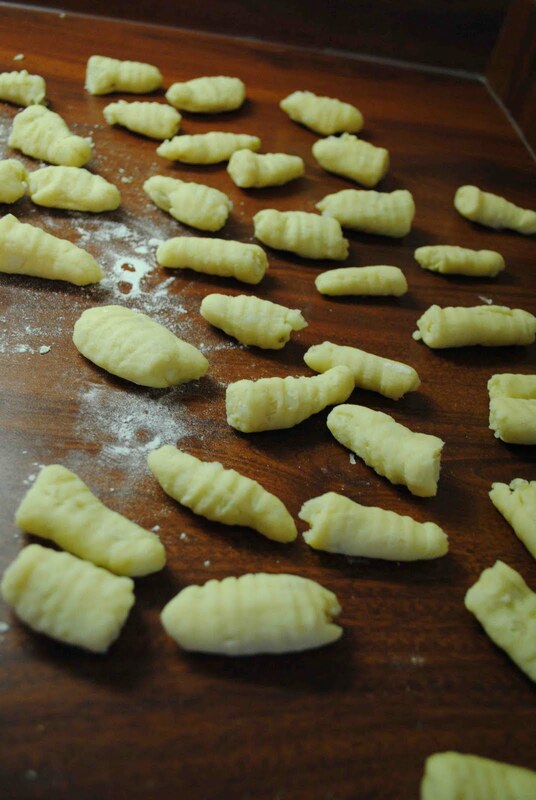 Roll the pieces over a gnocchi board or the tines of a fork to give them ridges. Cook the gnocchi in boiling water in small batches until they float to the surface, about 2-3 minutes. Remove from the water and drain.